Most guests spend 1 or 2 full days at the park. Discover the fascinating marine life of SeaWorld San Antonio, where thrilling rides, exciting adventures and enchanting encounters with some of the world’s most amazing creatures are always right around the corner. Dive into this incredible underwater kingdom to see some of the most amazing marine animals. With so many things to do at Sea World San Antonio, Texas, you won't ever have to worry about being bored! Once inside, you’ll find the perfect blend of amusement park fun and wildlife exploration. Stop by the popular Dolphin Cove and say hello to a lively pod of Atlantic bottlenose dolphins, or venture into the Penguin Encounter exhibit where more than 100 different kinds of penguins dive, swim, and play. Adrenaline junkies can head straight to The Great White to test their limits with the 360-degree loops and flips on this exhilarating coaster that races around the track at nearly 50 miles per hour! But the fun doesn't stop there. Animal lovers everywhere will love the backstage tours that provide unbelievable up close and personal interaction with some of the most amazing creatures of the sea. Feed an Atlantic bottlenose dolphin, reach out and touch a penguin, or make friends with a sea lion. The opportunities at Sea World of San Antonio are endless! In addition to the interactive exhibits, backstage tours, delicious eateries, and exciting rides, the shows at SeaWorld San Antonio also offer breathtaking majestic saltwater creatures like beluga whales, killer whales, Pacific white-sided dolphins, sea lions, and more! Not only will you be amazed at what these awe-inspiring animals can do, but you’ll also have the opportunity to learn all about life underneath the ocean. And remember, these animals are large so you can expect lots of big splashes throughout each show! Of course, SeaWorld also provides visitors with a variety of dining options such as Shamu’s Smokehouse, the Sea Star Market & Café, the Rio Grille, and many more! A diverse assortment of sweets are also available at Polar Parlor, Azul Treats, or Shamu Soft Serve so you never have to worry about going hungry. From exhilarating rides and interactive exhibits, to exciting shows filled with the colors and exotic animals of the sea, it’s safe to say that a visit to SeaWorld San Antonio will always result in the adventure of a lifetime. The Great White: The most thrilling ride in the park, this coaster brags 360-degree flips and an incredible speed of 50 mph. 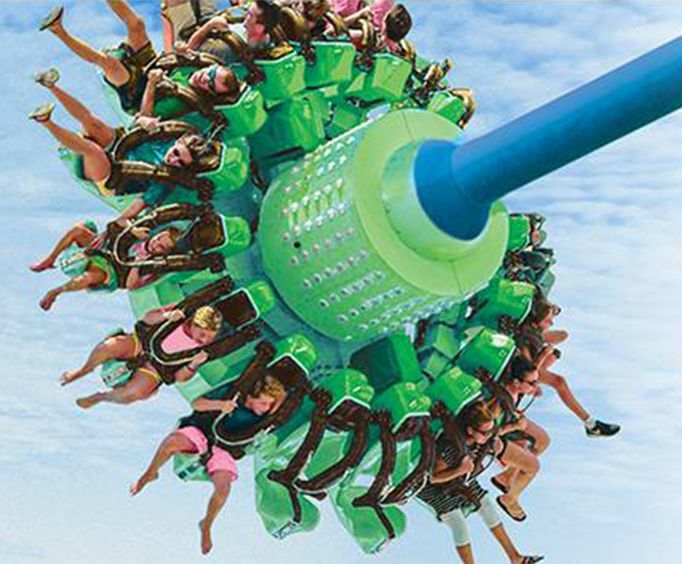 Steel Eel: This hyper-coaster challenges riders to a stomach-flipping drop of 15 stories. 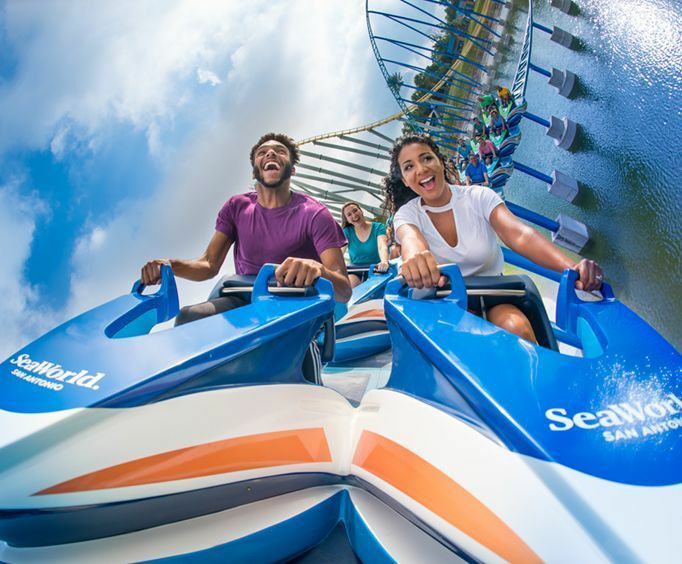 The Seaworld San Antonio Steel Eel is a fan favorite, so of all the Sea World San Antonio rides, this one is one you won't want to miss! Journey to Atlantis: Combine the gigantic splashes of a water ride and the heart-pumping thrills of a roller coaster for an experience that’s simply the best of both worlds. Rio Loco: Big splashes and a crazy river make for one exciting ride in a circular raft. With plenty more rides at Seaworld San Antonio, you're sure to find something for every member of the family! If you're still wondering what to do at Seaworld San Antonio, check out one of these amazing shows featuring the park's finest, including the Seaworld San Antonio Shamu show! Pets Ahoy: The kids will love this comedy featuring some very talented land animals like dogs, cats, pot-belly pigs, and more. Ocean Discovery: This show is a beautiful display of the ocean’s wildlife harmony featuring Pacific white-sided dolphins, the majestic beluga whale, brightly-colored birds, and talented acrobats. The Seaworld San Antonio dolphin encounter is one the whole family can enjoy, so check out some of the most beautiful underwater creatures! Sea Lions High & Sea Lions at Play: Learn about intelligent and silly sea lions during these two awesome shows. Audience interaction and splash zones make these events fun and immersive. Killer Whales Up Close and One Ocean: SeaWorld is passionate about their animals, and here guests can learn from the trainers about orca habitats, behavior, and experience the inspiring One Ocean event. Dolphin Cove: Get up close and personal with SeaWorld’s pod of Pacific white-sided dolphins. Penguin Encounter: Meet these cute, playful creatures and watch as they dive, swim, and play on the ice-covered cliffs. Pacific Point Preserve: This coastal town provides visitors with up close views of incredible marine wildlife and a brand new, exciting show. Explorer's Reef: Enter this 700,000 gallon shark-filled territory and encounter some of the prehistoric hunters of the ocean. Continue on next door where you’ll find a beautiful coral reef overflowing with exotic, colorful fish. Animal swims: Guests can swim with beluga whales, dolphins, and sea lions. Animal Conservation Center: For those who enjoy learning, this center is a great place to visit. Here, guests can see tons of reptiles and more. Alligator Alley: Dare to enter the domain of these ancient predators as they silently float through the waters. Rio Grille: Enjoy grilled favorites like burgers and hotdogs alongside sandwiches and salads at this casual, family-friendly eatery. Sea Star Market & Café: This unique open-air market provides guests with a fantastic shopping experience while they munch tasty light lunch options like wraps, salads, and sandwiches. Smokehouse Grill: Head to the smokehouse for mouthwatering, tender barbecue that falls off the bone. Rosita’s Café: This restaurant has something for everyone with a variety of pastas, pizzas, salads, and fruits. Sweet Treats Bakery: Choose from freshly baked cakes, candies, and fudge for a satisfying desert experience. Snack Attack: Pick up a quick snack like cotton candy, a waffle cone, frozen lemonade, or a root beer float. Azul Treats: Grab a delicious pizza, turkey leg, or some sweet cotton candy. The frosted lemonade is one treat you just have to try! Polar Parlor: Indulge in your favorite ice cream, sundae, or root beer float at the Polar Parlor. Ice Cream Parlor: Pick from a variety of delicious ice cream flavors or pick up a salty snack like nachos or chips. You'll never run out of things to do at SeaWorld San Antonio, so take the whole family for a vacation they'll never forget! Valid for unlimited admission to both SeaWorld San Antonio and Aquatica San Antonio for three (3) consecutive days from date of first use from the start of the 2019 park operating season. 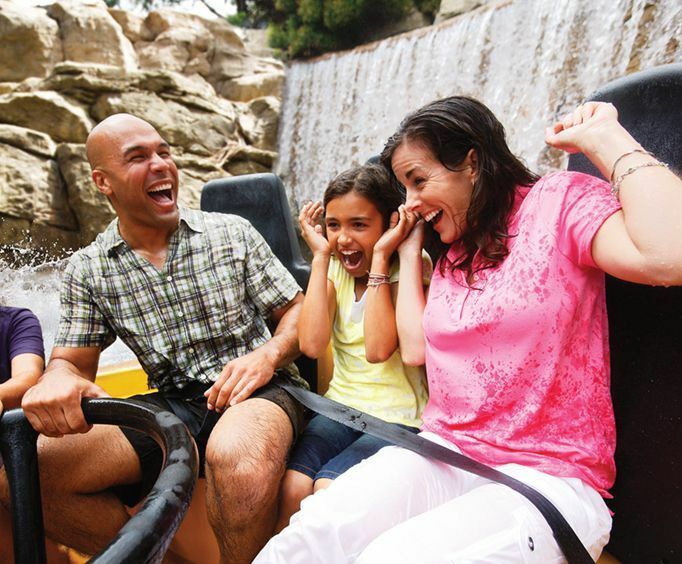 Enjoy two days at the amazing SeaWorld and Aquatica theme parks! This two-day pass allows guests to have a blast on all the rides, shows, and more at these two great parks. Valid for a single day admission to SeaWorld San Antonio during the 2019 park operating season. What is included in the admission price for SeaWorld San Antonio? Includes admission to the park with all the rides and shows. Approximately how long could a customer plan to spend at SeaWorld San Antonio? There is a gift shop, eateries, ATMs, restrooms, and lockers are available for rental ($10 - 20). A limited number of strollers and wheelchairs are available for rent. Strollers are $20 and wheelchairs are $10. Is SeaWorld San Antonio handicap accessible? For what ages is SeaWorld San Antonio appropriate? Is parking available at SeaWorld San Antonio? Is it free? General Parking is $21.25. Preferred Parking is $24.94. "We loved every moment of Sea World. " We loved every moment of sea world. The kids had a blast and had tons of things to do! All the rides were included in the ticket price and we didn't have to pay any extra ... Except for gifts! Shamu rocked! "Excellent shows,excellent rides and a beautiful environment!I"
Excellent shows,excellent rides and a beautiful environment!I would totally go back there again.The animals were spectacular and were very well trained, the jet ski show was nothing like we've ever seen in our life!!!!!!!! "the vacation was AWESOME! I have already decided that I will be using and recommending Vacations Made Easy from now on." "We loved Seaworld! My daughters and I had the best time! " We loved seaworld! My daughters and i had the best time! The whales and dolphins were breath taking to watch. There's also a show called pets ahoy with dogs, cats, birds and even a pig! Its a must see! Just be sure to get there 20 minutes or so before show time because the auditorium is smaller and fills up quick. There's a large playground area with rope climbs and tunnels and all sorts of things that my girls loved. We also enjoyed the mermaid grotto where you can meet a real live mermaid! :) another tip i didn't realize is that you can bring in outside food and drinks. I will definitely do that next time as with any park those can get pricey. So nice to know seaworld allows this. Hope you enjoy it as much as we did!